The Aare Ona Kakanfo of Yorubaland, Dr. Gani Adams, has told the All Progressives Congress that restructuring if the country is the way forward, reports ITRealms. Speaking when are team sent by the APC Deputy National Chairman (South) of the party, Engineer Segun Oni, paid him a visit at the Lagos home of Adams to dialogue with on the proposal of the APC to restructure the country and present to him copies of the report of the Committee on Restructuring. The Committee, headed by the Kaduna State Governor, Malam Nasir el-Rufai, submitted the report to the National Chairman of the party, Chief John Odigie-Oyegun, a few weeks back. The delegation from Oni, made up of Senator Olu Adetunmbi, the Secretary of the el-Rufai committee, and Otunba Ben Oguntuase, told Adams that as one of the champions of the restructuring of the country, his input remains critical to the eventual position of the party on the issue. Adetunmbi said: “We are here to let you know that your views are important. We cannot embark on such a project without consulting proponents of restructuring like you. Adams, apart from his personal views on restructuring, was also at the 2014 Constitutional Conference, where he and others championed the cause. Adams told the delegation that his first instinct was to clarify from them if the position of the party on restructuring was not just to get reelected in 2019 only to abandon the cause thereafter. He said his belief in the restructuring of the country remains unshaken and unwavering, adding that without it, “we cannot become a Nation speaking with one voice and with a single focus”. The Aare Ona Kakanfo said the restructuring of the country cannot be said to be complete without resolving the issue of State Police and the reversal to the six geopolitical structure of governance. He said the present structure of governance was not only lopsided and a waste of resources, it can also not guarantee the flow of democratic dividends to the people at the grassroots, who should be the priority of the government. 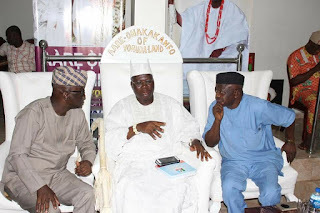 The All Progressives Congress has taken its campaign for the restructuring of the country to the Aare Ona Kakanfo of Yorubaland, Dr. Gani Adams. “There is no way the man at the grassroot will feel the impact of governance if the majority of the decisions affecting his day to day living are taken in Abuja. Aare Adams said he stands with anyone or group that believes in the restructuring of the country, adding: “Before we begin the talk of election in 2019, this issue must be tackled headlong.